There were 718 press releases posted in the last 24 hours and 153,537 in the last 365 days. 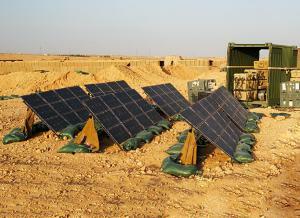 An Alternative Energy System (AES) is shown deployed at a combat outpost in the Middle East. An Alternative Energy System (AES) is shown deployed with a Persistent Surveillance System-Ground (PSS-G) tower on a mountaintop in Afghanistan. Solar Stik®, Inc., shipped its 100th Hybrid Power System (HPS) on Friday, Aug. 17, 2018. 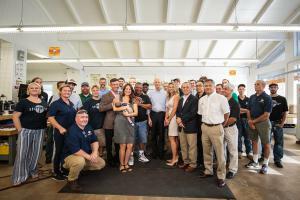 Also on that day, Florida Governor Rick Scott visited the Solar Stik Production Facility to announce the State’s July job growth. ST. AUGUSTINE, FLORIDA, USA, August 23, 2018 /EINPresswire.com/ -- Solar Stik®, Inc. has marked the completion and shipping of its 100th Hybrid Power System (HPS) 7000 with a celebration at the company’s headquarters in St. Augustine, Fla. The HPS 7000 reduces the fossil fuel consumption of fuel-driven generators used by many military applications by sourcing stored energy from a battery bank and prioritizing renewable power generation sources—solar and wind—to maximize the operational efficiency of power circuits. Solar Stik received its first order for the HPS 7000 in June 2014. The U.S. Army initially ordered 50 systems to support the reset of the Rapid Aerostat Initial Deployment (RAID) surveillance tower system. The RAID Towers were refurbished during reset and became the Persistent Surveillance Systems-Ground (PSS-G) Heavy, a tower platform that provides 24/7, 360-degree visual coverage with an electro-optical/infrared (EO/IR) sensor and real-time situational awareness (SA) video capability. The PSS-G platform was enhanced during reset to include an Alternative Energy System (AES) in order to improve reliability and increase autonomy when deployed in remote, off-grid locations. The HPS 7000 was selected as the Alternative Energy System (AES) enhancement for the PSS-G Heavy over competing power systems, as it enables commonality of components among the PSS-G variants because of the scalability and modularity inherent in its system architecture. The HPS 7000 configured to be the AES for the PSS-G Heavy included 16.8 kWh of energy storage and a 2.7 kW solar panel array that could be scaled down for the smaller PSS-G variants. The PSS-G Heavy AES also has the capability to automatically start and stop the 5 kW Tactical Quiet Generator (TQG), enabling it to run only when the battery bank is discharged to a predetermined level. Another critical factor for the U.S. Army selecting the HPS 7000 was that Solar Stik’s HPS 5000 already had a proven record of powering the RAID Towers in theater. The primary power management module for the HPS 7000 is the PRO-Verter 7000, which can support a continuous load of 4 kW and can also combine inverter output with generator output to deliver up to 7 kW of surge capability as long as battery capacity permits. Five of the PSSG-Heavy AESs were shipped in late 2014 directly to Afghanistan to power RAID Towers that were to be set up in remote locations and operated jointly by U.S. and Afghan forces. This urgent need led to the foreign military sale (FMS) in January 2016 to the Afghan National Army (ANA) for 20 HPS 7000s configured to auto start both the 5 kW TQG and the 5 kW AMMPS generator. The 20 systems for ANA are currently being used to power both RAID and PSS-G Heavy Towers that were transferred to the Afghani government. They also included 7.2 kWh of additional energy storage since they also powered a workstation with an environmental control unit (ECU). The U.S. Army has since made the AES officially part of the baseline for the PSS-G Heavy, leading to more orders. The most recent orders for the AES had only slight component changes from the original 50 HPS 7000 systems, including upgraded lithium-ion battery technology and solar panels. These changes were based on feedback received from operators in the field and rapidly integrated by Solar Stik in order to improve system performance. Since the initial order for the HPS 7000 in 2014, the Solar Stik Team has grown from 22 members to 35, with many of the new members filling roles in the company’s Production and Engineering Teams. Solar Stik’s operational facilities have also been increased with ground being broken earlier this month for a new research and development building. The new facility will house 3D printers, multiple computer stations, and specialized testing machines. 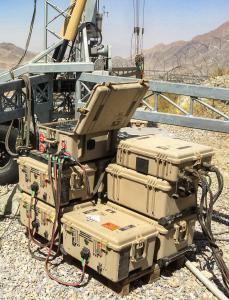 These investments in personnel and equipment are part of Solar Stik’s commitment to provide leading-edge technologies and the most reliable portable power solutions in support of the Warfighter. Visit http://www.SolarStik.com to learn more about its products, people, and company culture. Contact Ceal Potts, marketing specialist, at cpotts@solarstik.com or 800-793-4364 ext. 140 for more information. Follow us on Twitter and Facebook using @solarstik.